10/15/2012Share this story on Facebook! 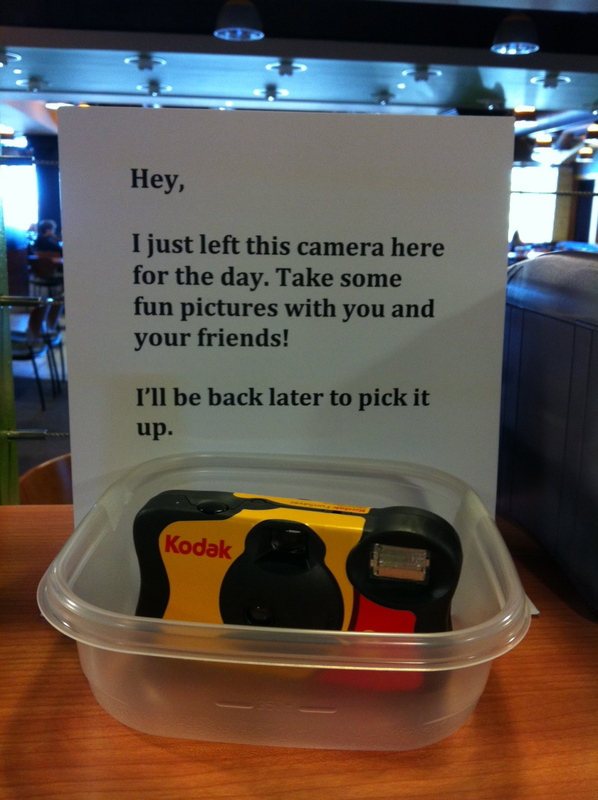 There were five of them -- identical plastic containers that appeared randomly in five different locations across campus on a Thursday morning, each holding a simple disposable camera and a note encouraging anyone who found it to “take some pictures of you and your friends.” But who would do such a thing? And who even used disposable cameras anymore? Many students surmised that a photography major was getting creative with a project. Some suspected an ICTV show. But few knew the real truth - the cameras were placed by Ithaca College's student social media team, a group of 18 students that meets weekly to strategize the best ways to showcase the college on Twitter, Facebook and just about anywhere else they see fit on the internet. “The social media team finds creative ways to inform the world what Ithaca College is all about,” said Kourtney Day ’15. The group was inspired by similar disposable camera projects others have done in some American cities. Over a series of meetings, the team decided how many cameras to use, where to place them, and how often they would be checked throughout the day. One of the toughest decisions was whether or not to sign the note left with each camera. "It was fun to leave the school's name off the project because it allowed students to embrace the spontaneity of the project," said Georgie Morley ’14. "We saw a lot of students who thought the cameras were for a photo student's project and it was great to see that so many people wanted to help their peers out. It just reinforces how much IC students support each other, especially in creative endeavors." When the day came, some of the students were nervous about what might happen. "The morning started off slow with only a couple of pictures being taken in the early hours," according to Ben Ratner ’14. "But as lunchtime rolled around, more and more people started to interact with the cameras… Soon my skepticism had gone away and I knew we were on to something." 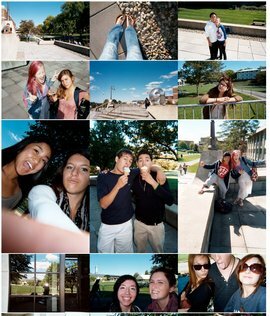 At the end of the day, the team had distributed and collected ten cameras, each full of an authentic view of life at Ithaca College. The team also hid small video cameras near a few of the locations to capture the cameras being used. Afterward, they collected the footage into a video showing the whole process and some of the photos being taken. Once developed, the photos were uploaded to a special website along with the video for everyone to see. Viewed together, the photos show a mix of work and play, a testimony to the Ithaca college student culture. Some took photos of others studying, while come captured a wide view shot of campus. Many took pictures of their friends, some serious, some goofy, some just happy. The project speaks to the student team’s overall goal to create projects that embrace the concept of connecting the real world to the virtual world. "The student social media team was delighted with the results of this project, and I think it's given them a launchpad for many more in the future," said Rob Engelsman '11, IC's multimedia content specialist who supervises the team. "In fact, we've already got a few others in the pipeline that should be pretty special." But don't take our word for it -- see the results for yourself in the video, then head to lifeatic.tumblr.com to see all the photos and share your favorites.